We recently announced our partnership with Griffeye, the world’s premier intelligence and visual big data platform. The Griffeye team had a chat with our Founder and CEO, Martino Jerian, to address questions about the challenges and opportunities in image and video forensics, what the partnership means for customers, and what the future holds for Amped Software. Read the full interview below. Martino, please introduce us to Amped and what sparked the idea for your company initially? The inspiration for Amped Software came when I was doing my masters in Electronic Engineering at the University of Trieste in 2005. While working on my thesis in Digital Image Processing at the University of Trieste, in collaboration with the Scientific Investigation Department of Carabinieri (Italian Military Police) I realised there was a big opportunity to create software specifically for processing images and videos related to security and investigations. Amped Software was officially created in 2008 and my ultimate aim has been to create tools that are the world standard for the investigation of images and videos. What need does Amped Software fill in the market? When I started there were already several other image and video forensic companies in the market but as a forensic scientist, I realized that not one single product met all of the needs of a forensic analyst. Product functionality was limited, very pricey for the features on offer and did not deliver what users needed. I saw that there was an opportunity to a single tool that is the defacto standard for successfully handling all the forensic tasks needed on images and video for forensics and investigations. Can you explain what Amped Software does? We have three different products. Amped FIVE is our first product and our flagship piece of software. It analyzes and enhances images and videos, using more than 100 features that solve specific issues – from dark videos and blurred pictures to rare and strange technical problems. Amped FIVE also generates a technical and scientific report to explain how and why a picture or video has been modified to ensure that it is admissible in court. Our second product is Amped Authenticate, advanced technology that evaluates the authenticity of images and documents and tells the user if they have been altered or tampered. The software can do camera ballistics to identify the specific model that has been used to create a picture. Our final product is Amped DVRConv, our newest product which addresses the big issue of proprietary video file formats from surveillance systems. Amped DVRConv automatically converts unplayable video files into standard formats so that videos can be viewable. How is Amped Software used by customers? 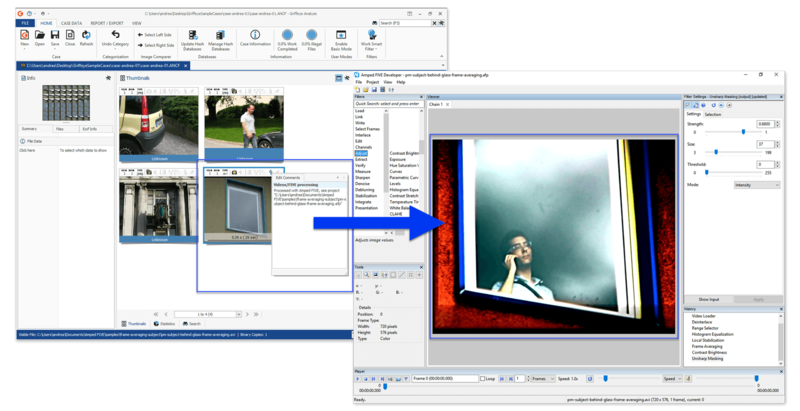 Amped Software can be used by anyone that needs to analyzse videos or images as part of forensics and investigative work. For example, take a crime that has been committed on CCTV and involves a get-away car. The quality of the CCTV is likely to be very low, the car may have been moving fast so it makes it difficult to read the license plate. We can take the footage and enhance the quality to get the license plate, protecting the validity of the image. Typically, our software is the perfect fit for any law enforcement investigators or private forensic labs that need to work through large amounts of images and videos. How has Amped Software evolved? We still see a lot of development opportunities for our products so our focus is on continually improving features to reflect what our customers need. This involves regularly releasing updates to deliver those, or even make improvements and bug corrections. Some of our most recent updates have included introducing new filters that restore colour or illumination to an image and new shortcuts and programme options that make our Amped FIVE product even easier to use. We are also looking to develop software for authenticating videos, where we are starting to see more customer demand. What trends do you see affecting the market in the future? The amount of data and the quality of videos are two of the biggest challenges. Increasingly, we are seeing that there is more and more material to analyze so it’s essential that image and video forensic investigators can operate as quickly as possible, focusing their time on usable evidence that delivers a result. In what direction do you see Amped Software going in the next couple of years? I want Amped Software to be recognized as the best for forensic image and video analysis software. To achieve our aim of being a one-stop shop for all image and video processing needs we will work to build a network of companies that are the best in this field, such as Griffeye, and create a shared network of infrastructure that meets the evolving needs of our customers. How does the Griffeye partnership support Amped in achieving its vision of being the world’s premier creator of forensic image and video analysis software? The synergy between our products supports our customers in completing digital forensic investigations. Griffeye’s Analyze DI provides image and video processing technologies that can be used to handle large volumes of images and videos, filter irrelevant digital files and identify pertinent material. If investigators see something of interest in DI then the image or video can be sent to Amped for closer analysis and authentication. Through the collaboration, we can automate the forensics investigation process to make workloads more efficient and reduce the gaps to have a greater impact. When did you first come into contact with Griffeye? Our partnership with Griffeye came about in response to customer demand. We share many customers and there was an opportunity to partner on a project in Europe, which led to our integration. How will this partnership benefit the forensic community? This partnership is a way of connecting great technologies together and showcasing the power of the API. When Griffeye released Analyze 16.1, it introduced an API that allows users to connect to other tools. This means that our joint customers can seamlessly take images or data from Analyze, transport it to Amped tools for further investigation and then seamlessly communicate the outcome back to Griffeye, in one workflow and without any additional manual processes. Our collaboration will open up new possibilities that support faster and more efficient forensic image and video analysis. Both Amped Software and Griffeye advocate a similar approach – working closely with the end-user and making sure that customers are getting a well-serviced technology. This reflects how we are part of a new breed of companies that are seeking to make sure tools have as much impact on the forensics community as possible. This entry was posted in Announcements, Press / Media on December 7, 2016 by Darlene Alvar.